Many of us can’t wait to take a break from our desks at work. While many head to the watercooler to gossip or slip out for coffee, others occupy themselves with mobile games. There are thousands of games out there but of course, some are more popular than others. Here are six games which people have been playing at every available opportunity. Android Authority listed Minecraft as one of the best games of 2017 and one that’s popular around the world with people of all ages. Minecraft has no specific objective but it puts you in a giant world where you can mine, build things or do whatever you want. There is also a survival mode where you must mine your own resources and food. New possibilities are added in frequent updates. Download Final Fantasy 15 and explore a world on the brink of chaos. Join popular characters like Noctis and Lunafreya to prove you can become ruler of the empire. Hunt for treasure and defeat monsters with players from across the globe. This version of the game is the largest open-world massively multiplayer online game in the series. Pokémon Go burst on to the scene in 2016 and quickly became popular around the world. Since it’s an augmented reality game, you have to walk around your real world environment to catch Pokémon, battle for Gyms, and hit up Pokestops. New Pokémon and limited time events are often added to keep the game fresh. If word games are more your thing, one of the most popular mobile games helps you to build your vocabulary or test your word-building skills. Words with Friends is a multi-player game in which players take turns building words in a Scrabble-like manner. You can challenge your Facebook friends to a game or play with strangers who may soon become friends. You can also sharpen your skills alone in solo mode. Hopefully this puzzle game won’t make you hungry. Swap brightly colored pieces of candy to make a match of three or more of the same color to remove those candies from the board and replace them with new ones. This may seem easy and it is quite simple at first. However, each level poses new challenges like achieving a particular score in a fixed number of moves. Hundreds of levels mean you’ll never run out of challenges. 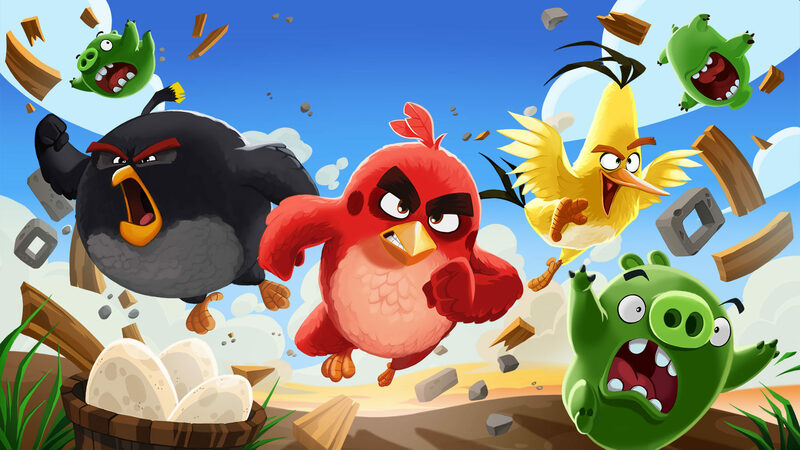 Angry Birds has been touted as the number one mobile game series of all time. It focuses on multi-colored birds who try to save their eggs from their enemies who are green-colored pigs.As a player, you’ll use a slingshot to launch birds at the pigs in an effort to destroy all the pigs on the playing field. New types of birds become available as you advance through the game. Everyday millions of people use their breaks to play these games and take a breather for the demands of the workplace. Whether you like solving word puzzles, playing match-three games or exploring open world environment, there is certainly a game out there for you. If you’re not yet playing one (or two) go ahead and give one a shot.